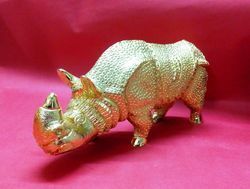 We are leading manufacturer of Gold Plated Rhino Sculpture. Our organization is placed among the noteworthy organizations offering an excellent assortment of Gold Plating Rhino Sculpture. The offered sculpture is developed adhering to precision engineering design and sciences. Optimum quality raw materials and superior method is used for manufacturing the sculpture. Moreover, the sculpture contains layers of vastu sciences that eliminate negative energy from home and offices. Furthermore, clients can avail the sculpture from us at affordable prices.